On Saturday, May 18, Best Start Watts-Willowbrook hosted a Resource Fair at Ted Watkins Park in Watts that attracted more than 500 local residents. The event started at 9:00 a.m. with a walking tour of several community organizations, beginning at the Watts Labor and Community Action Committee (WLCAC). General manager and renowned community leader Tina Watkins welcomed participants and provided a tour of the WLCAC facilities and the Cecil Fergerson Gallery. Community activists from the East Side Riders Bike Club also demonstrated bike tricks for children and their families. The walking tour concluded at Ted Watkins Park, where another 40 organizations were on hand to talk with participants about critically important services and resources that are available in Watts-Willowbrook and across South Los Angeles. These organizations included Shields for Families, Watts Health Corporation, California WIC, Cedars-Sinai’s COACH for Kids and Kaiser Watts Counseling and Learning Center. Entertainment included the LA County Arts Commission, which hosted J.A.M. Samba Dance Party sessions; Hoop it UP, which held hula hoop lessons for children and parents; cooking demos and face painting with the Watts Healthy Farmers Market and a performance by the Watts Village Theatre. Leaders from Best Start Watts-Willowbrook shared their vision for the event, which was designed to get residents out and moving, while linking families to important and valuable resources located right in the neighborhood. Watts-Willowbrook is home to dozens of resource organizations and Best Start Watts-Willowbrook wants the community to know about them. The parents and residents who make up the Best Start Watts-Willowbrook Partnership—and volunteered their time—are committed to improving the lives of their children and the future of Watts. Best Start is an effort of First 5 LA, a child advocacy organization created by California voters to invest tobacco tax revenue in programs that improve the lives of children ages 0-5 in Los Angeles County. Best Start focuses its efforts on children ages 0-5 because studies show that 90 percent of brain development occurs in the first few years of a child’s life. Best Start Watts-Willowbrook is one of four SLA Best Start communities. 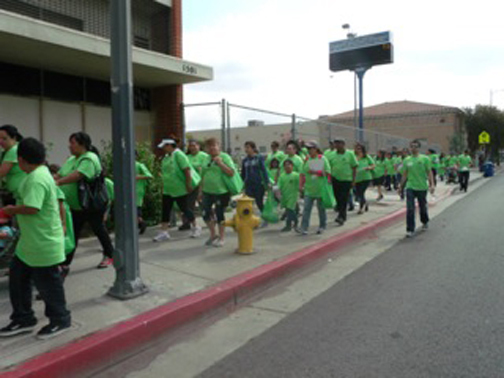 The other SLA Best Start communities also include Compton – East Compton, West Athens and Broadway Manchester.